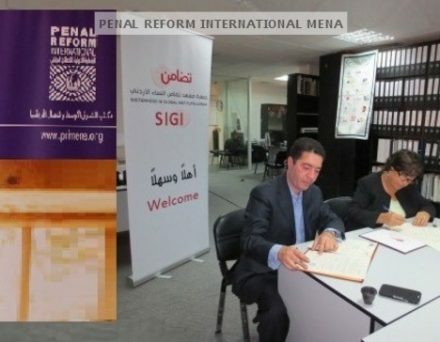 PRI MENA has signed a memorandum of cooperation on Thursday, August 29, 2013 with the Sisterhood Is Global Institute, SIGI – Amman for the Rehabilitation and Aftercare of prisoners in the correctional centers. The agreement was signed by Her Excellency Asma Khader – Secretary General of the Jordanian National Commission for Women Sisterhood Is Global Institute, SIGI – Amman and Mr. Haitham Shibley , Acting Director for PRI MENA. In her speech, Her Excellency said that the project aims for the aftercare of prisoners, especially administrative detainees, which will include the visits, legal assistance, and psychological and social support to complement reintegration activities; and added that a number of rehabilitation programs have already been implemented in the correctional centers with the cooperation of the Department of Correction and Rehabilitation Centers. Her Excellency also said that PRI is now implementing a unique pilot project for the aftercare of prisoners on release in aims to facilitate their reintegration into society. And that is by providing assistance to obtain employment, or establish small projects, or vocational training to enhance their skills to start their new life and achieve financial independence and prevent crime re-occurrence. The duration of the pilot project will be three months, and an assessment will be made at the end of the period to evaluate the effectiveness of the project in attaining the goals and for an extension for a longer period. The project will include the Rehabilitation Center of Juwaidah for females and the Rehabilitation Center of Um Loulou for men. Mr. Haitham Shibli said that the project is the first to operate directly with the corrective system in Jordan by providing the service directly to prisoners in the two centers. Mr. Shibli also confirmed Her Excellency’s words and said that the rehabilitation and training process has started since three months either through the civil society organizations or through social workers in the Ministry of Social Development by providing physical or psychological training inside the correctional centers. The project will be implemented in cooperation with all related parties headed by the Department of Correctional and Rehabilitation centers , the Ministry of Interior, the Ministry of Social Development, PRI MENA, and the European project to support penitentiary centers .